Fiction – paperback; Faber and Faber; 304 pages; 2003. 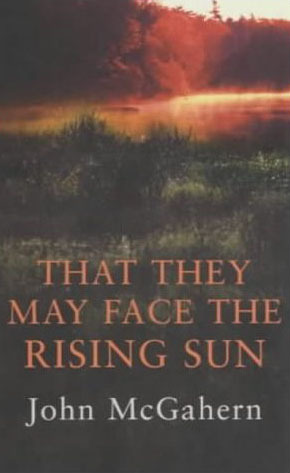 This book, published in the USA under the title By the Lake, was the last novel by Irish writer John McGahern, who died, aged 71, in 2006. It is a beautiful, slow-moving book that mirrors the gentle rhythm of rural life and brims with a subdued love of nature. In its depiction of the changing seasons and the farming calendar — the birth of lambs, the cutting of hay — it tells an almost universal story about humankind and its relationship to the land and the climate. But this is more than a book about what it is like to live in the Irish countryside. It also tells an important, often overlooked tale, of how humans interact with each other when they live in small communities. That They May Face The Rising Sun is brought alive by a cast of intriguing, some might say eccentric, characters, although it mainly revolves around a pair of middle-aged outsiders — Kate and Joe, who fled the London rat race to try a gentler way of living. Over the course of a year we learn about their ups and downs, their hopes and fears, the ways in which they lead their quiet lives on a day-to-day basis and the people they befriend along the way. There is little action to drive the narrative forward. Instead the reader comes to know — and appreciate — the rituals of rural living that inch this story along. Aided by McGahern’s calm, meditative prose, it’s hard not to be emotionally affected by the simplicity — and realism — of the story. I loved every word. I had this book in my hand and chose “If No One Speaks of Remarkable Things” instead. I’m glad I read that, but now it looks like I might have to go back and buy this one too! I have just finished it (literally minutes ago) and would agree with all the high praise you’ve heaped upon this book. I loved the language the characters used and the slow pace of life. It was a wonderful read that transported me to rural Ireland. I was sad to finish it…fabulous. Thanks so much for suggesting it. Phew. So glad you liked it! I didn’t really review it properly here. How could I review such a brilliant book? I’m minded to read it again now. I’m making slow progress through his book of essays and have fallen in love with his style and his mind all over again. Just came across your wonderful blog as I was searching for reviews of work by John McGahern online… I recently stumbled upon a very interesting list > “Newsweek’s top 10 novels of the decade” and guess what book was selected as #1 there?? I wrote my Irish Top 10 before I even knew who McGahern was, hence his absence from the list. He is definitely my favourite author of all time and discovering his work was a real eye-opener. Why did no one tell me about him earlier? The essay collection is a slow read. Im only dipping in and out of it, so you might need to be patient: it could take another year to get through!